This toy is no longer being made by the company. Read on for our recommendations and alternatives. Unfortunately, Pulse is no longer making this model of the Kick ‘n Go Scooter. However, users have recommended the Trikke Electric Scooter as a similar alternative. 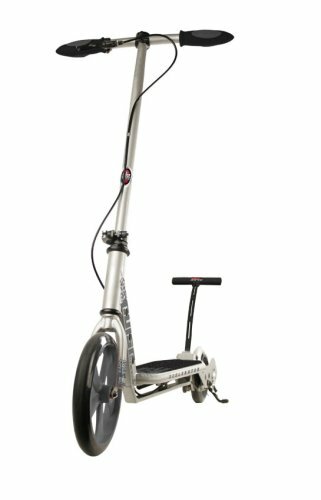 The Trikke scooter is an all-electric, effortless riding scooter. Comes in a box with all the parts of the scooter including wheels and metal scooter parts. Does not require batteries. To propel the Xcelerator scooter, the rider needs to place one foot on the back pump and press it up and down. A few pumps on the pedal will cause the scooter to start moving. However, without pressing the pump, the scooter will not move, so it is necessary to keep pressing every so often to keep the scooter going. Make sure to keep hands on the handlebars at all times, as the propelling motion can often be sudden and cause the rider to become unbalanced. Pulse’s Kick ‘n Go Scooter has received mixed reviews. The most common complaint is relating to the back pedal, which must be pushed up and down repeatedly for the scooter to move. It is not a true electric scooter, as the rider still has to do a good amount of work pushing the pedal to keep the scooter going. Especially for younger children, it can be difficult for them to reach the back pedal, and it may feel awkward for them when riding down the sidewalk in the neighborhood. Because of this, we recommend a child be at least 10 years old before using the product to ensure safety and effective riding. Once it is delivered, the assembling of the parts has been said to be incredibly simple- just put it together and go! It is structured well, allowing the scooter to handle a variety of weights, so it is equipped to support not only the youngest riders, but adult riders as well. Although it takes some effort, it’s much faster than the traditional way of scootering. Everything needed to assemble the scooter upon arrival is included in the box. We would not recommend this scooter for children under the age of 10. Balance is also a concern when riding this scooter. The way it is set up takes time to get used to and feel comfortable riding. Pulse is no longer producing this item. We are unable to get their product description.